It’s late 1961 and Dion is ‘hot’ with “Runaround Sue”, the number one song written by Dion with Ernie Maresca. A hit song opens lots of doors and “Runaround Sue” wasn’t the first song Ernie had written for Dion, (that had been “No-One Knows” a Top 20 hit for Dion & The Belmonts in 1958), so Ernie was looking like an equally ‘hot’ property which is why Danny Kessler, Marv Holtzman and Murray Sporn, the guys behind Seville Records knocked on Ernie’s door suggesting he record something for them. Whether Kessler and his associates had forgotten Ernie had been in a group called The Desires who recorded for them back in ’58 or not was immaterial; Ernie was now a hitmaker and they wanted some of the action……..and they got it ! 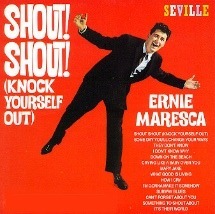 Ernie’s second release for Seville was “Shout! Shout! (Knock Yourself Out)” which shot into the American Top 10, peaking at number 6 in May 1962. An album, named after the hit, was issued in the July which received a favourable review in Billboard describing the tracks as ‘potent’ and the album being “…solid for the teen trade…”, but a Top 10 hit is no guarantee of long term success and so it proved to be for Ernie as a recording artist. His future was as a song writer, “Runaround Sue” was followed by “The Wanderer” and “Lovers Who Wander”, both of which made the Top 3 and then there was “Donna The Prima Donna” which was another Top 10 hit for Dion. Ernie continued to record for Seville until 1965, but he also worked with The Belmonts for whom he co-wrote “Come On Little Angel”, giving the group a Top 30 hit and later he’d write “Whenever A Teenager Cries” (for Reparata & The Delrons), a song that has become a perennial girl-group favourite. Among his other hit songs were “Runaround” (The Regents), a Top 30 hit in 1961 and “Party Girl” for Bernadette Carroll in 1964. The boy from The Bronx did good!